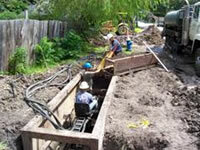 Amani was selected by City of Houston to provide Phase I, II and III design services for approximately 60,800 linear feet of water line replacement with sizes ranging from 6” to 8” in diameter. 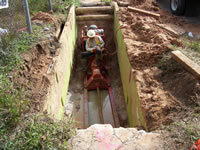 Upon record search and investigation, Amani identified an existing 12-inch water line installed in 1990. Amani proposed to delete approximately 5,400 feet of proposed water line replacement resulting in a cost saving of approximately $410,000. 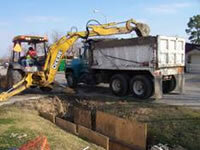 Project scope was increased to add streets within the project vicinity, with water lines older than 50 years, resulting in saving effort level for design and construction phase services. Amani proposed to acquire a 10-foot wide water line easement to connect new water line at south dead end and north dead end to avoid two dead ends and associated recurring Operation & Maintenance costs to the City. 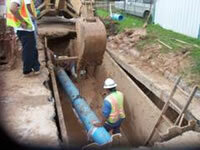 30-inch Water Line Interconnect with City of Houston and City of Pearland. As a sub-consultant, Amani is providing Phase II Design and additional services including Traffic Control Plan and Storm Water Pollution Prevention Plan for approximately 16,200 linear feet of 30-inch and 20-inch water lines along Monroe and Pearland Parkway. Project consists of designing two metering stations, as well. The proposed design includes aerial crossing at Clear Creek parallel to Pearland Parkway and Tunnel crossing under the existing Beltway 8 along Pearland Parkway. As a Prime Design Consultant, Amani provided Phase I, II and III Engineering and design Services for three (3) Water Line Replacement projects totaling approximately 111,000 linear feet. 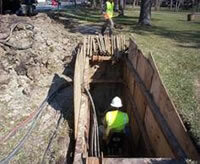 The sizes of water line ranged from 4 to 24 inch in diameter. Also provided additional services, which included Traffic Control Plan (TCP) and Storm Water Pollution Prevention Plan (SWPPP) to be used during construction. Amani completed these three projects ahead of schedule. Amani proposed to run a new 8-inch water line through an existing 10-foot wide easement after investigation of potential construction issues. This design effort reduced the need for approximately 2,800 linear feet of 8-inch line for a return loop at two dead end streets. Acquiring a 10-foot wide water line easement eliminated the need for 650 linear feet of 8-inch water line and cost savings of approximately $32,500. All the measures proposed were implemented without affecting water circulation in the distribution system. As a sub-consultant, Amani prepared Plans, Specifications and Cost Estimate (Phase II design services) for approximately 10,100 linear feet of 30-inch diameter Water Transmission Line in the Accelerated Surface Water Transmission Program.